Mother's Day weekend 2011 will stick in our minds for years to come! 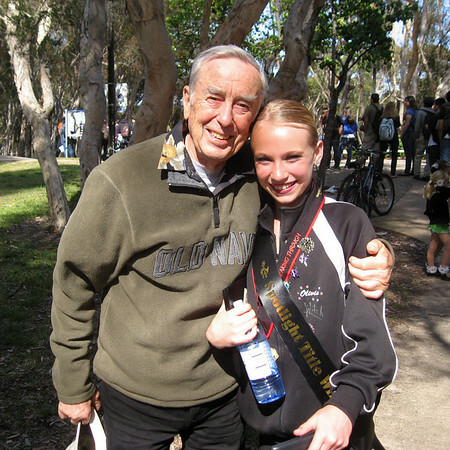 Heading out for another dance competition on Friday, Liv and I made our way to UCSD with my Dad in tow. The weekend schedule had us at the campus not only Friday, but Saturday and Sunday (Mother's Day) as well. With a full schedule of dances, we met up with her team and got down to the business of dance. First up - Junior solos, unfortunately Liv had woken up with a cold Friday morning and her energy was sorely lacking. Having one of the longer solos (she dances to the song "Shy" from Once Upon a Mattress) at just over 3 minutes I knew it was going to take everything she had to keep her energy level optimum. But she did! Bringing my dad to tears as she finished her performance and exited the stage we waited for the next part of the competition, the Title portion, where one of the girls participating in the solo section would be named "Junior Miss Spotlight". After introducing themselves, doing a quick dance combo and answering a question, the girls (and one boy!) strutted their "stuff". With six of our girls up there I was so proud of their confidence and poise, and each dance combo showed amazing talent and skill. With questions ranging from "What is your favorite planet?" to "Who is your favorite Super Hero? ", Liv couldn't have been asked a better question than the one she received, "What is your favorite dessert and and why?" A choco/sugar-aholic since birth this one was right up her alley! She smiled and promptly answered, "That's an easy one. I would choose Chocolate Fondu and have it piped throughout the house so I could just turn on a faucet and dip strawberries anywhere I went". With a smile she moved on to her combination and then we waited. Small Group Tap - see group below! Tough competition abounding, we crossed our fingers as the judges began to read the Top 10, and when they reached 3rd and her name hadn't been called my dad leaned over and said "This is either really good or bad". Holding our breath we then cheered heartily as they announced the 2nd place overall solo as "Shy" and Liv jumped up to receive her medal and plaque. Moving on to the Title portion, the contestants lined up on stage and looking at the talented girls in the line Liv was simply pleased to be a part of this amazing crowd. The judges stated that they would then play the music from the solo contestant who was to be named "Junior Miss Spotlight" and a moment later the look of utter shock on Liv's face as they played her song, "Shy", was priceless! She stood, mouth in a round "O" for a few seconds before her friend pushed her forward to receive the sash and award. My dad and I fought to see through our tears, and my heart couldn't have been happier for my girl. Junior Miss Spotlight and my Dad! Over the next two days Liv and her friends had a fantastic weekend together and the team danced and scored exceptionally well. For all of the moms and dads in the audience our hearts burst with pride and happiness watching our confident girls, making this one of the most memorable Mother's Day's ever. Arriving home Sunday evening with a hungry family in tow, I racked my brain for something quick to make. Remembering the bottle of K.C. Materpiece Hot Buffalo Marinade I had received from Foodbuzz as a part of the Tastemaker Program, I pulled out pizza dough and chicken. 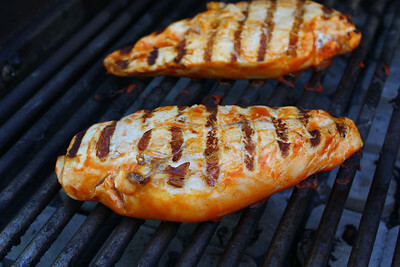 A quick dip into the marinade had the chicken flavored and I tossed it onto the grill to cook. Slicing a few onions and red peppers I grilled them until tender and then rolled out my pizza dough. Loving my grill as I do, I usually grill my pizzas - "no muss, no fuss". A quick rest on the hot grill grate gives one side of the dough a head start. I take the dough off the grill, placing it onto a rimless cookie sheet sprinkled with semilina flour where I dress it with sauces and toppings. This evening though, had me without any prepared sauce but with a bottle of the Hot Buffalo Marinade. Hmmm... spreading a thin layer of the marinade over the dough I topped the pizza with shredded cheese and the recently grilled marinated chicken and veggies. Returning the pizza to the grill, covering and lowering the heat we had a piping hot pizza in about 7 minutes! Smiling eyes greeted me as I served up the pie. With flavors reminiscent of buffalo wings, a slight spice cut by the melted cheese and a good amount of veggies, this pizza reminded me of a recent email from Foodbuzz asking featured publishers to enter baseball-themed recipes to Frigidaire and Jennifer Garner's efforts in the Save the Children program. Save the Children’s Early Childhood Education, Literacy, and Physical Activity and Nutrition programs reached more than 50,000 children in the United States last year alone. Combined with their Emergency Response work, they reached more than 60,000 children. Simply by entering this recipe Frigidaire will donate a dollar to the cause, and if you visit the Make Time for Change site and take a turn at virtual batting you can help too! 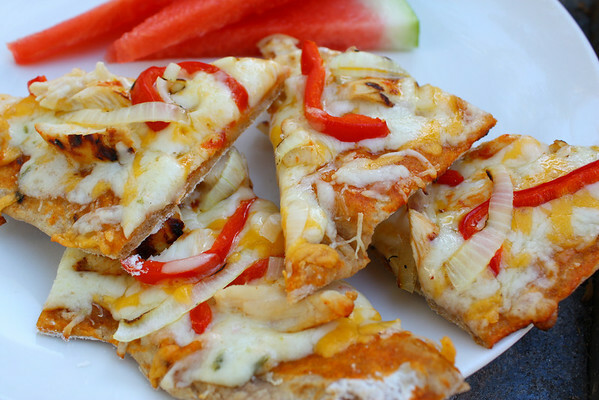 Our Buffalo Chicken Pizza seems to be the ideal tailgate food! With a portable Smoky Joe at the field you could easily prepare this cheesy pizza for a pre-game snack. Don't want to grill there?? The slightly spicy pizza is just as good snacked on when cold... and might I add it goes nicely with a cold beer. Marinate chicken in KC Masterpiece marinade for 30 minutes. Preheat grill to medium high heat. Grill chicken until done. Roll out pizza dough. Place the dough on the medium hot grill grates and grill for about 1 1/2 minutes. Remove from grill by "scooping" with a rimless baking sheet (or a pizza peel!). 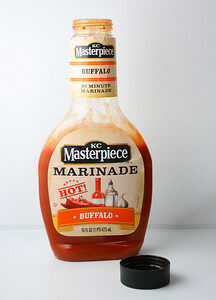 Flip to grilled side up and spread out a thin layer of the KC Masterpiece marinade. Top with your favorite cheese and grilled veggies. 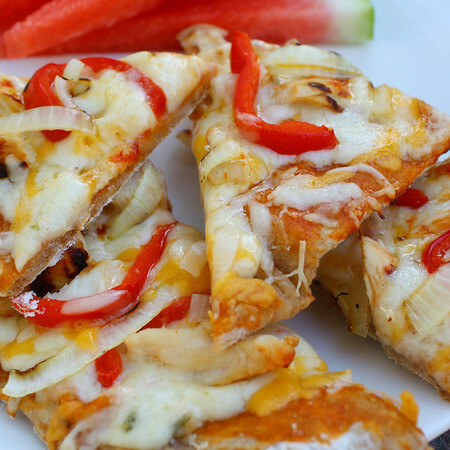 Cut the chicken into small pieces and scatter on top of the pizza. 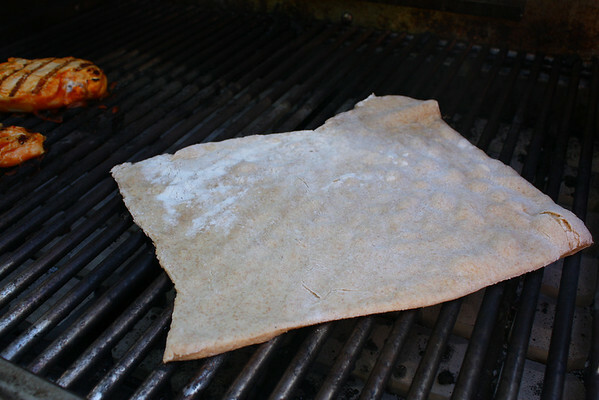 Slide pizza carefully onto one side of the hot grill. Turn the heat on that side to low, cover and grill for 4-7 minutes or until cheese is melted, checking every so often to make sure the bottom is not burning. Alternatively, the pizza may be baked in an oven, follow your favorite recipe for temps and times. Allow to cool for a minute or two and cut into slices. Top with your favorite condiments, I like diced avocado and chopped cilantro. Note: If desired, sprinkle semolina flour onto the peel or rimless cookie sheet before you "dress" the pizza for easier sliding onto the grill. Safe, Sane & Single, this tap number has you laughing till you cry! Looks like an amazing Mother's Day! Wow what a great idea! love it and such a great time was had ...gorgeous family! What a wonderful weekend! Please pass on my congratulations to Olivia - boy that girl can kick her legs high. I am so glad that all of her hard worked payed off in big ways. Her mom deserves a medal too since without her this would not be possible ;) I wish I could reach out right now and grab a slice of pizza. How about a little something from Kona Brewing to go with that? Congrats to Liv! I remember the days of practicing before a dance competition- lots of sweat and practice. Your pizza looks so yummy. I wish I had a grill so I could grill one up too!! Sigh apartment living. Congrats to Liv! I love grilled pizza but barely ever get to enjoy it. This looks delicious! What a weekend! It's like a blast from my past. Not too many years ago, I was Liv and MY mom was the one working the wonders behind the scene. Lovely post, thank you so much for sharing. Congrats to Liv! That is one amazing mothers day! and one amazing pizza..
Congrats! That's awesome! Your pizza looks fantastic! The grilled pizza looks SO yummy. Although I have to admit I am afraid of grilled pizza. My guy and I tried to make it last summer and failed miserably haha, mainly because we didn't know you had to grill the dough before you put the toppings on. We should try it again this summer I think. What an incredible weekend for you ALL! Liv is so amazing: love what she said about the chocolate fondu all over the house. Not just a pretty face! Congratulations, Liv. Your Dad and you must be the proudest people on earth, and no wonder. Lovely photo of your Dad with Liv! Kim, well done on waving your magic on this pizza. Looks fantastic. Bet you really enjoyed these beers to go with it, too - lots of bubbles deserved! That is so amazing! Congrats to you and your daughter. And that pizza...ooo that pizza. Looks delish. Grilled pizza is the best! Yay Liv!! Congrats to you both, and it sounds like a busy but wonderful weekend! And this pizza... Oh my goodness... I'm so hungry now! Looks like Liv's still on track for Lancer Dancer--and beyond! 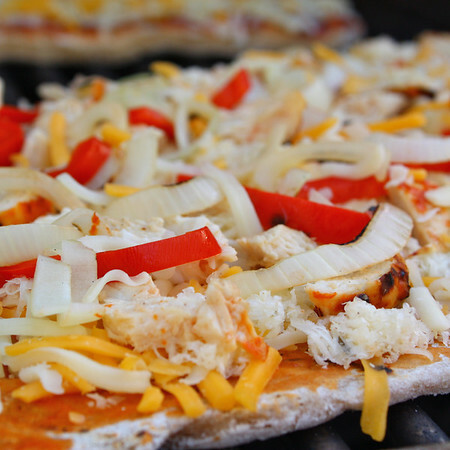 The pizza looks great too; I love it on the grill. Kim, KC Buffalo Marinade ... um... heck to the yes!!! Pizza sounds incredible! Love Buffalo chicken! On a grilled pizza, sounds amazing! And what a great sounding Mother's Day! I wish I could have seen that performance! The photos alone are entertaining. Liv has such a flair and passion for dancing, I can see it. She is AMAZING. Seriously, in my prime there is no way I could do half of what she can. I haven't grilled pizza yet but seriously I need to. This buffalo pizza looks CRAZY good! This might be one for my 12 year old to try and make one of his specialties! How are we supposed to comment about pizza after that amazing Liv story???? Congrats, young lady! Your pizza was good up until I read the last line about it going well with beer. Then it rocketed up to fantastic. :) It really does sound delicious and like something that will be made this summer. Way to go Liv! I love the pictures of Live dancing, what wonderful dancer she is (I agree with her on the chocolat fondue pipes...we should see if we can work something out). The pizza looks and sounds fabulous! A great finish to an amazing weekend! My little Ave says she wants to be a dancer when she gets older. Liv looks amazing in her photos and what a proud mama you must be. The pizza is right up my alley. I totally want to make this for my husband, he would love it. Congratulations to your daughter, and love the picture of her and her grandfather! My daughter just had her first "starring" role yesterday in the 4th grade musical "California Missions and More". She did a great job and I was a proud mom :-) Your pizza looks delicious too! I love to read about Liv! Congratulations to her!!! How long has she been dancing?? My daughter is 4 and I would love to put her in dance classes. Have you considered putting up video of Liv dancing?? Or have you and I just haven't found them yet? This pizza looks fabulous! I love everything buffalo wing flavored. I would probably make a sauce with that marinade and some ranch. Oh my...yum! I've been wanting to try grilled pizza for a while...maybe this will be my first grilled pizza attempt. Thanks for sharing! Oh, Liv is such a good dancer! The pizza is very colourful and looks absolutely yummy.